A bundle of literacy and math activities I use in my kindergarten classroom with a monster/pumpkin theme. 3) A monster themed write the room. Cut the word cards apart, hang them around the classroom. Students hunt for the words, and use the recording sheet to write them. 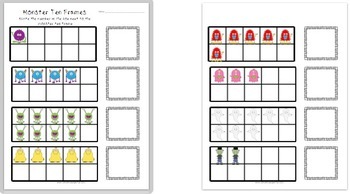 5) A pumpkin themed upper/lowercase matching sheet with "5 Little Pumpkins Sitting on a Gate"
6) A monster themed 10 frame activity. Students count the monsters and write the number. 7) A monster/pumpkin themed sight word game. Print out a game card for each player. Use unifix cube or other counters to use as markers on the game board. 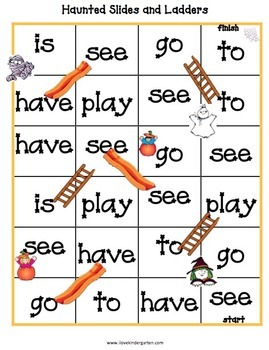 Students roll a dice, move to that spot, move up the ladder or down the slide, then say the sight word.